Making a DNA molecule model requires a little knowledge about its structure. DNA commonly known as deoxyribonucleic acid is a double-stranded helical molecule. DNA contains adenine, thymine, guanine and cytosine as its four bases. The four DNA bases pair up with sugar and phosphate molecule to form nucleotides. The adenine combines with thymine by two hydrogen bonds. Similarly guanine and cytosine are attached by three hydrogen bonds. Each helical turn of DNA has about 10 nucleotide pair. Divide your 120 Styrofoam balls into six groups. Assign red color for thymine, blue for guanine, yellow for cytosine, and orange for adenine group. Paint balls of each group with their respective colors. You will also need color coding for pentose sugar and phosphate molecules. Leave balls plain white for pentose sugar group. Paint green color on the balls of phosphate molecule group. Allow the balls to dry for next 24 hours. Imagine a ladder in your mind. The four bases will represent as the steps of the ladder. The pentose sugar and phosphate molecules will be your ladder itself. You have to make a ladder with your balls. Push one orange and one red ball into the toothpick. Add glue at the ends of your toothpick. Insert white balls at both the ends of the same toothpick. Make sure that the white balls are properly attached at the ends of the toothpick. Insert a new toothpick into the white balls. Your new toothpick should be perpendicular to the ladder rung. Push a green ball into the toothpick. Place your laboratory stand on the flat surface. Attach the ladder rung onto the base of your laboratory stand using glue. Make another strand of yellow and blue balls. Attach white and green balls similarly as described in step 3 and step 4. Keep on adding strands one above the other. You can only pair orange and red balls on one strand. Similarly yellow and blue will be paired on another strand. Slant the white ladder rung end and green rung divider, once you are in the middle of your laboratory stand. A slight slant will give a helical look to your DNA molecule. Pubmed: Structural properties of g,t-parallel duplexes. PriyankaA. 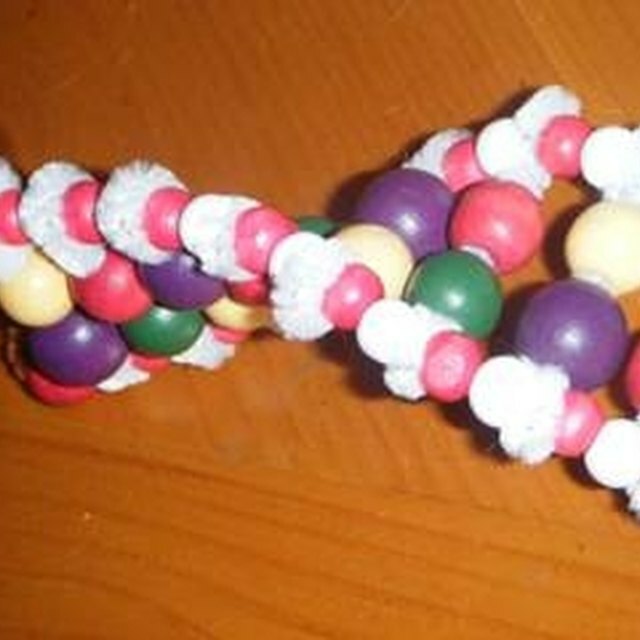 "How to Build a DNA Molecule School Project." Sciencing, https://sciencing.com/build-dna-molecule-school-project-7662828.html. 24 April 2017.